← I met Top Chef’s Padma Lakshmi at the Bite of Seattle! My friend Helen, who is vegan, and I like to joke that Filipino food—the food that I grew up eating—is the least vegan cuisine out there. It’s meat with a side of meat and some rice. However, Helen remained curious about Filipino food and is a perseverant cook. She surprised me by making her own karioka, which is essentially a set of Filipino doughnuts on a stick. It turns out that karioka is vegan. That piqued my interest, and I started wondering if there were other vegan Filipino foods. One day Helen and I were chatting on Twitter about a recipe by Astig Vegan for vegan lumpia, one of the quintessential Filipino foods. I was surprised to find that lumpia wrappers are vegan. I had been sure that there they were made with eggs, but they aren’t. This revelation opened up a world of possibilities. I told Helen that we should make vegan lumpia together. Then our friend Dawn, who is also vegan, said she wanted to join in the fun. Like any good Filipino, I decided that lumpia wasn’t enough food. 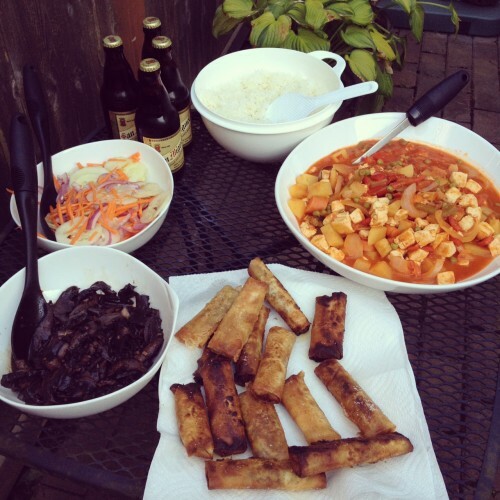 So I proposed that Dawn, Helen and I cook a complete vegan Filipino dinner together at my house. All three of us happen to be food bloggers. Helen’s blog is Vegtastic! and Dawn writes Vegan Moxie. This would be a fun opportunity for me to learn more about vegan cooking and hang out with two fabulous ladies. Also, because we were all bloggers, we could take as many photos of every stage of food preparation with no complaints! I wanted to make a dinner that was vegan but one that Filipinos—vegan or not—would actually eat. After consulting many recipes, I decided on the following menu: lumpia as an appetizer, portabella adobo and tofu afritada for the entrees, a cucumber and carrot side salad, plenty of rice, and coconut sorbet for dessert. I chose adobo because it is the national dish of the Philippines, and it’s something almost every Filipino eats and knows how to make. I had made adobo with portabellas before, and I knew it was good. I modified an adobo recipe on VegTalk vegan forum. A cucumber salad was something that my parents almost always served at their dinner table. I used the recipe for Asian cucumber salad that Alice Currah has in her Savory Sweet Life cookbook. Coconut is used in a variety of traditional Filipino desserts so I thought a coconut sorbet would be a great finish to the meal. The recipe I used didn’t turn out so I won’t bother linking to it. More on that later. Helen prepared the lumpia filling, Dawn took on the adobo and the cucumber and carrot salad, and I made the afritada and the coconut sorbet. 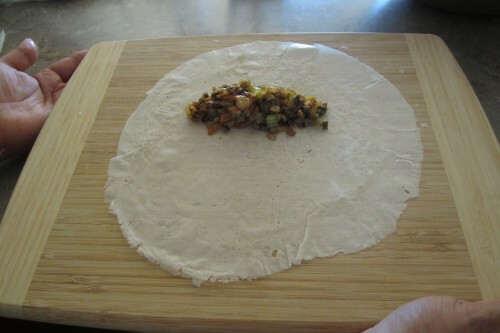 After finishing my dishes, I demonstrated how to roll lumpia. I told Dawn and Helen to avoid the rookie mistake of putting the filling in the middle of the wrapper. 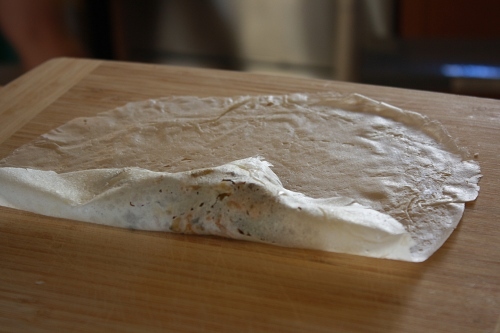 You actually want to put the filling on the top third so that you have plenty of wrapper to go around the filling and securely bind. That way, it won’t open up when you fry it. Helen and Dawn were fast learners, and I was very impressed with their lumpia wrapping skills. 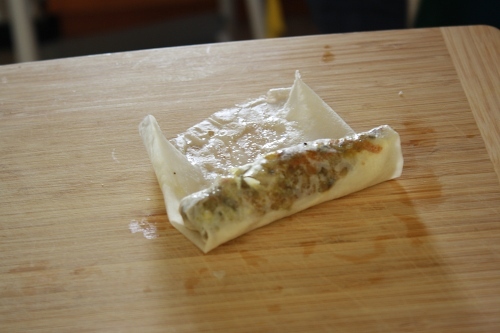 Usually lumpia is sealed with a beaten egg with a little bit of water. 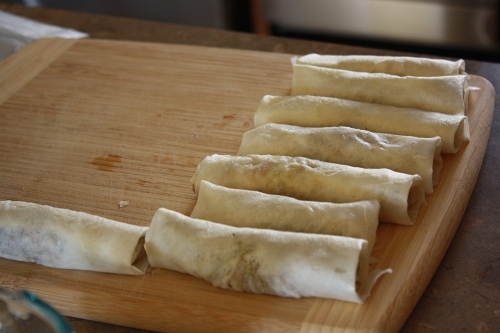 The vegan lumpia recipe called for Ener-G egg replacer, and Helen brought some. I had never heard of it and used it somewhat dubiously. Then I learned that it’s made with potato and tapioca starch flour, and I had much more confidence in its binding power. Dawn fried the lumpia, and then it was time to eat! While we ate dinner, the coconut sorbet churned in the ice cream machine. However, after 45 minutes, the coconut sorbet was not getting any thicker. We had some leftover lumpia wrappers so I decided to make another dessert—turon. 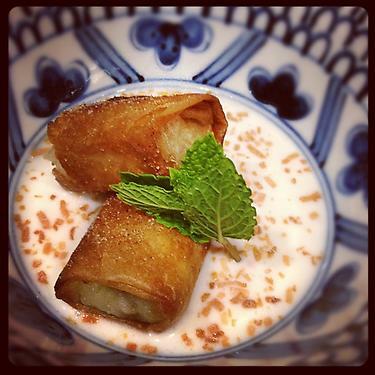 Turon is basically sweet lumpia that is traditionally made with jackfruit and plantains. I happened to have some canned jackfruit and bananas so I improvised. I peeled the banana, cut in half, then cut each half lengthwise so that I had a flat panel of banana. Then I put some of the canned jackfruit on top of it. I rolled it up, fried it and dusted it with sugar and cinnamon. I put the soupy coconut sorbet in a bowl, cut the turon in half at an angle, and placed the pieces in the middle of the bowl. I garnished it with toasted grated coconut. Dawn took this awesome photo, which shows that all those years of watching Food Network finally paid off—look at that plating! The next day I had some leftover afritada for lunch, and I realized with horror that it was walang lasa—without flavor. I sent a tweet to Helen and Dawn saying that they had been too nice to tell me that my afritada was terrible. They insisted that it was fine and maybe just needed a little salt. My friend Sophia, who is Filipino, saw our conversation on Twitter, and commented that I was probably missing the flavor of fish sauce and wondered if there was a vegan substitute. That made a lot of sense. I added actual fish sauce to the afritada, and the flavor instantly improved. 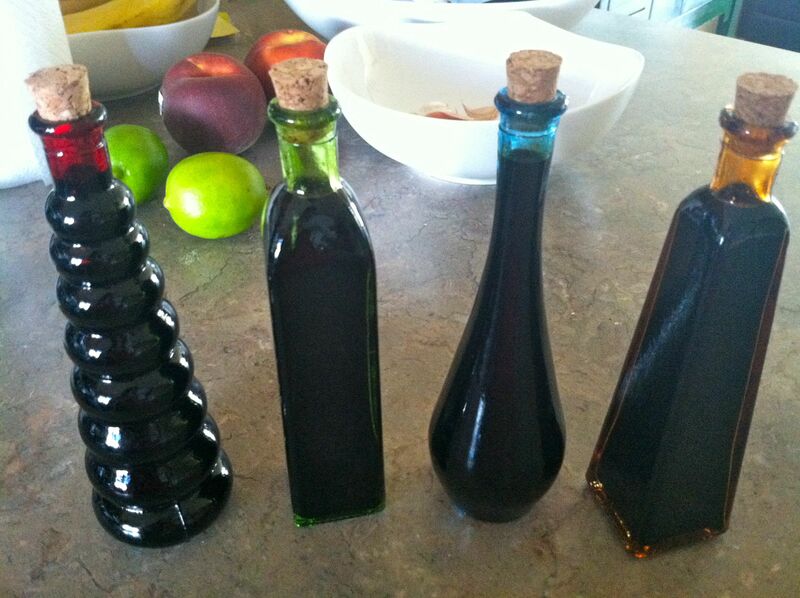 Dawn sent a link to a vegan fish sauce recipe from The Kitchn, and I decided to make it. 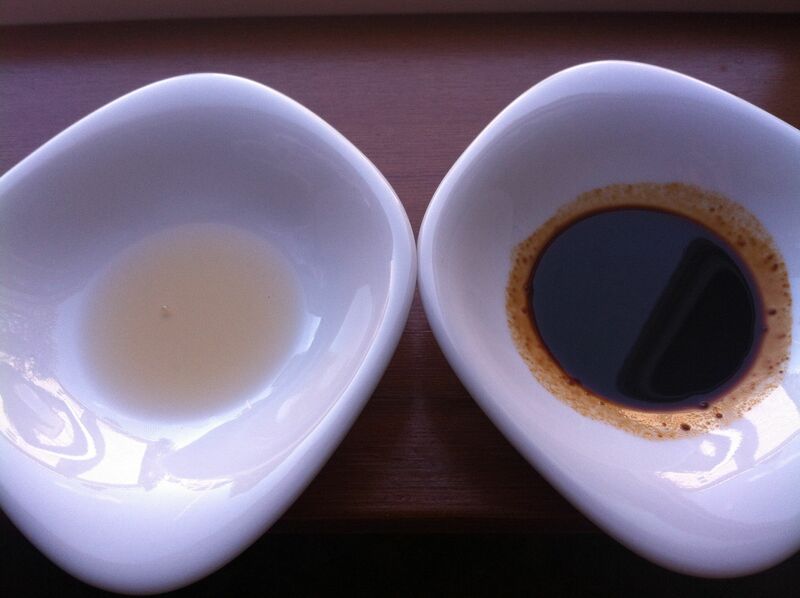 Vegan fish sauce gets its extreme saltiness from seaweed and depth of flavor from mushroom soy sauce and miso. I had never heard of mushroom soy sauce and nearly went blind at 99 Ranch Market trying to find it among rows and rows of different kinds of soy sauce. They only had one kind. If you’re going to make this recipe, make sure you go to a good Asian grocery store, or order the mushroom soy sauce online. I was curious to see how the vegan fish sauce would compare to the real thing so I did a side-by-side taste test. There’s really no substitute for fish sauce, but I was amazed to find that the vegan version was a pretty close match. Then because the recipe yielded 3 cups of vegan fish sauce, and there was no way I would be able to use all of it, I decided to give some to Helen, Dawn, and Sophia. All of this vegan cooking reminded me that I practiced vegetarianism about a decade ago because it was healthier and less impactful on the environment. However, I always considered it impossible to be completely vegetarian because of my Filipino heritage. I now know that I can make vegan food that is healthy, delicious, and true to Filipino flavors. Thanks, Helen and Dawn! Tagged as adobo, afritada, Astig Vegan, banana jackfruit turon, coconut sorbet, cucumber salad, Dawn Quinn, Filipino food, Helen Pitlick, Lumpia, The Kitchn, tofu, turon, vegan, vegan fish sauce, Vegan Moxie, Vegtastic! I cannot believe this, there’s a recipe for vegan patis? My life is complete! haha! I’m glad that it tastes similar 🙂 So you tried going vegetarian before? Aww you should continue! hehe Now you have plenty of veggie Filipino choices 🙂 Btw, thanks for mentioning my blog. I’m very honored. Thanks, Nicole! I’m definitely going to try and make vegan pancit next. Super yum. I miss the food from my trip to the Philippines. I love that I can have those flavors without meat and dairy. Thank you! I went to a plant-based, whole foods diet about a year and a half ago. My mom is filipino and I have missed eating all the filipino foods I grew up eating! I stumbled on this today and am so glad!! I have really been craving adobo over the past year! Hahaha. I am definitely going to try some of these recipes! Thank you so much!! Denise, you’re so welcome! The blog Astig Vegan is my total inspiration. Her recipes for vegan Filipino food are amazing and taste just like the original meat-based dishes. Try her vegan dinuguan. It will blow you away!